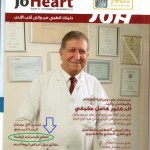 TapeConcept Ltd. had an article in the Jordan Medical magazine: Joheart. The November issue mentioned the medical taping concept (MTC) and the use if Curetape. We would like to thank our partner in Jordan for these arrangements.